For patients who’ve lost one or more consecutive teeth due to a sports accident, advanced gum disease, or severe decay, we may be able to replace lost teeth with a fixed bridge. Sometimes referred to as crown and bridge, these replacement “bridge” teeth are supported by dental crowns affixed to surrounding healthy teeth. 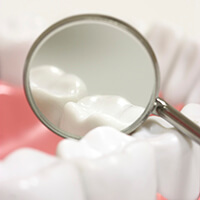 A bridge restores lost dental structure and prevents additional oral health issues such as dental drift, the shifting of teeth to fill in gaps. At Rogersville Family Dentistry, we are happy to offer custom-crafted, natural looking and feeling fixed bridge tooth replacement to restore the function of patients’ smiles, allowing them to speak clearly, chew thoroughly, and maintain their healthy, youthful appearance. A bridge combines a number of custom-crafted prosthetic teeth into a single restoration. On either side of the replacement tooth or teeth, are two crowns that attach to surrounding teeth supporting the replacement “bridge” tooth. 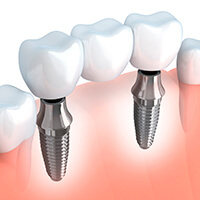 If there are not healthy teeth to support the bridge or patients prefer a more natural restoration, we may recommend dental implant supported bridges. If patients have more extensive tooth loss, a traditional or implant supported full or partial denture may be a better solution.